fring, the mobile communication service that pioneered mobile video over internet calls across smartphone platforms, now brings the world’s first dedicated group video chat service to the iPad. fring’s iPad Group Video chat enables four friends to simultaneously video chat one another, & see friends across a host of devices including iPhone, Android & Nokia, over any internet connectivity (Wi-Fi, 3G or 4G). "With fring on the iPad, users enjoy full-size 9.7-inch LED, glossy widescreen Video chat, with Multi-Touch display and optimized picture quality using fring’s proprietary DVQ™ technology," the company said. The fring iPad Group Video chat experience is wrapped in an intuitive, natural gesture- navigation where users drag & drop friends into Group Video chat, move their video chat stream & seamlessly augment video chat with parallel communication like tandem text chatting. 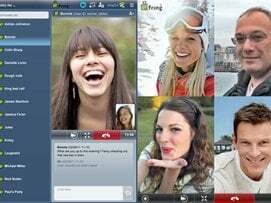 In addition to free Group Video chat, fring enables users to make free two-way video chat, voice calls and live chat with friends on Android, iPhone/iPod touch & Nokia Smartphones. fring’s iPad Group Video is available from Apple’s App Store.